At the time of her interview, Ms. LaPlant was a project coordinator for the Montana Center for Childhood Trauma. 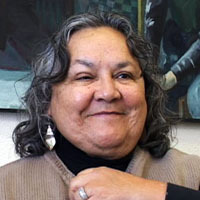 She currently works for the Division of Educational Research Services at the University of Montana’s School of Education. Ms. LaPlant is a valuable resource on the complicated issue of intellectual property rights and thus addresses the need for histories that incorporate tribal perspectives. Written History, Tradition, and Ways of Knowing - Patty LaPlant.